All bonus bet promotions offered by Palmerbet can be claimed by entering a Promotional code into 'Redeem Promo', found in 'My Account'. You MUST enter the promotional code before depositing to claim the redeposit bonus promotion. Please note Terms and Conditions apply to all Palmerbet promotions. After entering the promotional code, deposit required funds to claim the relevant re-deposit bonus promotion. You can deposit funds HERE. Once you deposit your funds, the bonus funds will be displayed in the 'My Bonus Credit' wallet, this can also be found in the 'My Account' section. Once you have your bonus ready, you just need to choose what you would like to back, then enter the stake amount into the betslip, make sure you have 'Use bonus?' ticked and confirm the bet. 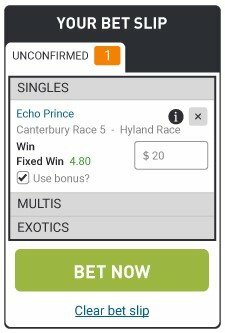 Please Note: Bonus bets have a minimum odds of 1.40 and cannot be used on Multi bets or exotics. Once you receive the bet 'Accepted' message you can view the pending bet in the 'Pending Bets' found in the 'My Account' section.